is a "Wolf in Sheep's Clothing" - cruise from point "A" to point "B"
Alan Andrews Yacht Design Inc.
259 Marine Drive, Long Beach, CA.  Female molded, vacuum infused high quality vinylester resin E-glass sandwich construction, employing knitted biaxial fiber and unidirectional glass reinforcements with variable thickness and density PVC closed cell foam.  Local reinforcing with additional glass and high density foam is added where deck hardware is installed.  Premium quality white gel coat in combination with vinylester resin provides excellent resistance to blistering.  Hull with single tapered boot stripe.  The Retractable keel comprises of stainless steel strut, E-glass shell and epoxy filler, with a lead bulb attached to bottom plate and optional kelp cutter.  Keel fin is securely held in keel trunk with urethane plastic guide block and positive locking mechanism.  Keel trunk is an integral structural part of major hull reinforcement. 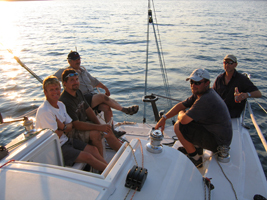  Rudder is made of molded carbon fiber composite skins injected with high density epoxy foam.  Rudder blade slides in to carbon fiber composite cassette. 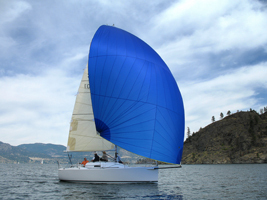  Cassette has integral ½" stainless steel shaft connected to stainless steel gudgeons mounted on transom.  Rig with double aft swept spreaders and molded carbon fiber mast tube with integral luff groove.  Two topmast spinnaker halyards with chafe guards.  Hounds attachment for forestay and two jib/spinnaker halyards.  Integral masthead crane with backstay attachment.  Continues SS wire rigging.  Boom is made of carbon fiber composite material with integral luff groove with two sheaves on each end for outhaul and reef line.  Main hatch companionway integral ladder and engine cover of cored composite material with non skid pattern.  10HP Yanmar diesel engine - 1GM10 with SD20 saildrive.  Saloon settees port and starboard with 4inch upholstered foam seat and back cushions.  Two top access storage lockers under each seat.  Removable table over keel trunk.  Two opening portlights 17"x7" above galley and navigation station.  Two compression posts of carbon fiber, one supporting mast and leading edge of keel and the other connecting aft edge of keel trunk with cabin top to provide support for keel lifting.  Removable V-berth with 3inch upholstered foam cushions.  Three top access storage lockers under cushion.  Waterproof hatch to access forward storage. 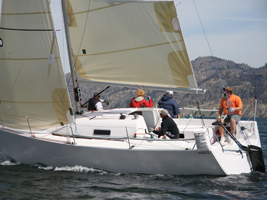  Lewmar 22"x22" low profile foredeck hatch.  Cored composite galley module with integral molded composite sink with hand pump and removable fresh water container below, and Forespar seacock for drain.  Two hinged doors access to storage and garbage bin.  Deep composite molded ice box with plastic cutting board lid.  Cored composite navigation module to starboard.  Removable mounting panel with bottom access, electrical panel, space for VHF radio and 12V and 110V receptacle.  One hinged door to storage shelf and 6.5 gal custom holding tank.  Head compartment aft of navigation station on starboard side with entry trough rolled door.  Manual marine toilet with double action pump and Forespar seacock for inlet and outlet.  Access aft to wet locker hanging area and storage.  Double berth aft of galley on port side extending under cockpit with 3inch upholstered foam cushion.  One top access storage locker and top access to area for battery, battery main switch and custom aluminum diesel tank.  Storage behind bulkhead aft of double berth accessed trough two hatches in cockpit.  Deck has mold in non-skid pattern at all stepping areas for maximum safety.  Double lifelines to meet ORC standards to include bow pulpit, six stainless steel stanchions and two stern corner stanchions connected with uncoated 3/16", 1x19 stainless steel lifelines.  Six Wichard folding pad eyes for shroud chainplates at sheer line bolted trough both deck and hull flange.  Two Wichard folding pad eyes for topmast backstay.  Two Wichard folding pad eyes for forestay chainplate with forestay to forward bale and aft as tack bar. 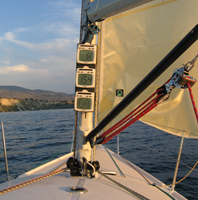  Stainless steel mast base c/w Harken mast base halyards lead blocks.  Anderson 28ST two speed primary winches and two Anderson 18ST single speed for halyards.  Two Spinlock XTS/3 clutches for halyards with two Spinlock organizers.  Harken midrange boat track for mainsheet elevated on blocks for easy pit drainage.  Harken small boat tracks with cars for jib sheets with adjustable position.  Plastimo emergency pump and 110V shore power receptacle on port side and Yanmar control panel and Spinlock throttle control on starboard side.  Ventilation of aft storage area is provided with two 3" vents.  Two Spinlock lifting and tying pad eyes for stern and bow.